FIGURE 2.4 Mean structural Young's modulus and one standard deviation of old stages of development of climbing plants with different modes of attachment. Black bars = dicotyledons, stippled bars = gymnosperms, white bars = monocotyledons, striped bar = lycopod. of less than 1000 MNm-2, approaching that of many tendril climbers and twiners and, interestingly, well below that of all of the other hook climbers. Stems of Lycopodiella cernua interlock with the surrounding vegetation via lateral branches. The younger parts of the plant show relatively stiff mechanical properties of over 8000 MNm-2, in the range of woody rigid species like Bauhinia and Strychnos (Table 2.1; Figure 2.3 and Figure 2.4). The older stage at the base of the plant is more flexible but still retains high values of around 3000 MNm-2. Note: Values of Es1r are based on means and 1 standard deviation. g Old stems of Bauhinia guianensis are ribbon-shaped; the maximum diameter given here corresponds to the diameter of a circular surface equal in area to the ribbon-shaped stem in cross section. h Measurements of Rosa canina are confined to leaning or climbing stems up to 1 year old. i Data for these climbing palms include measurements based on old stages in which the outer leaf sheath has been lost via natural aging. The other species are all based on older portions of climbing stems in which the leaf sheath is still attached but usually, at least, partially senescent. FIGURE 2.5 (a) Young phase of growth of the understory climbing palm Desmoncus polya-canthos (French Guiana). When the plant becomes mechanically unstable, it produces leaves equipped with distal hooks and grapnel-bearing cirri (left). (b) Young phase of growth of Calamus acanthospathus (Yunnan Province, China). When the plant becomes unstable, long modified inflorescences bearing recurved hooks (flagellae) are produced, and the plant can reach the canopy, producing stems over 70 m in length. (c) The calamoid rattan palm Plecto-comia himalayana (Yunnan Province, China), old stage of development in which the young part of the plant is firmly attached in the canopy and the older part of the axis is spanning a wide space between supports. The leaves and leaf sheaths of this part of the stem are senescing and lose their attachment with the original supports. 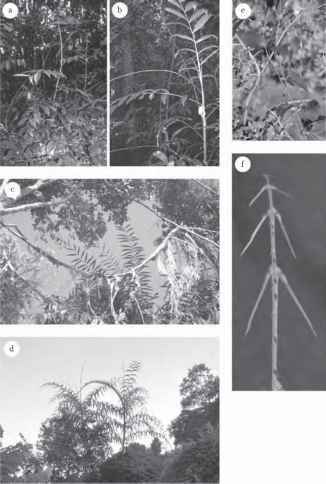 (d) Apical parts of P. himalayana emerge from the forest canopy (Yunnan Province, China) and bear many cirrus-bearing leaves and many potential attachment points with the surrounding canopy vegetation. (e) The small-bodied Smilax aspera (southern France) uses both apendicular tendrils and recurved hooks for attaching to host plants. Tendrils firmly connect the plant to the host. (f) Apex of the attachment organ (cirrus) of Desmoncuspolyacanthos (French Guiana) produce laterally deployed grapnellike modified leaflets (acanthophylls) and abaxially placed recurved spines. 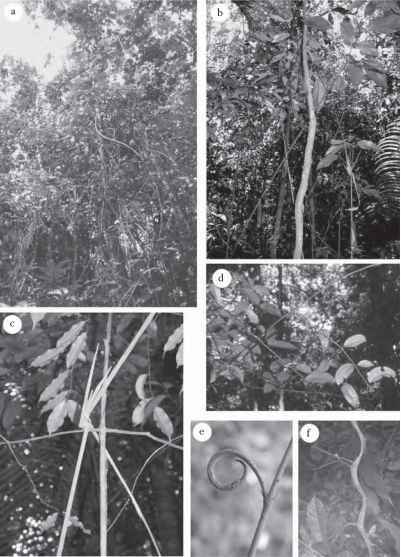 FIGURE 2.6 (a) The branch-angle climber Croton nuntians (French Guiana) shows a well-attached apex and flexible older stems descending to ground level. (b) The climbing monocotyledon Ischnosiphon centricifolius (French Guiana). Its narrow pencil-like stems ascend into the understory. 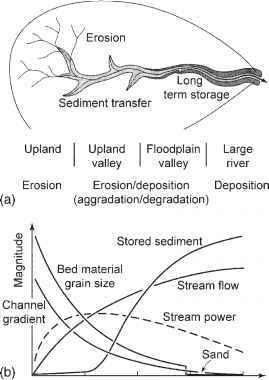 (c) The angles formed between successive nodes and internodes in stems of Ischnosiphon centricifolius provide effective points of attachment. (d) Stiff distal branches and sensitive hooks of Strychnos sp. (French Guiana). (e) Unattached hook of Strychnos sp. When hooks locate a host branch, they can develop a more secure attachment by tendril-like growth and woody development (French Guiana). (f) Appendicular woody tendrils produced from Bauhinia guianensis. Such structures can form firm attachments to narrow diameter host branches (French Guiana). stem show relatively high values of Estr of around 5000 MNm-2, which is in the upper range of values for twiners and hook climbers. Interestingly older, more basal parts of the plant show very high values of Estr of over 10,000 MNm-2 (Table 2.1; Figure 2.3 and Figure 2.4).